Distribution will be based on sales through resellers. 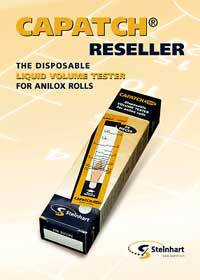 Definition of a reseller: a company with a good national reputation, well established in the national (flexo) printing market, that buys Capatch from us and resells it to end users of Capatch in their country. If you as an end user are interested in the Capatch, please send us an email or fax, and we will forward your email or fax to the nearest reseller. We have resellers in more then 50 countries. If you are interested to resell Capatch in your country, please send us an email. have done a personal demonstration to the potential customer before they sell Capatch. Every Capatch box contains a plastic doctor blade, which is an essential part of the Capatch product. If a reseller would like to have his company logo with contact information printed on the back of the plastic doctor blade tool, the reseller must send his logo in maximum two colors, by email, vector (not pixel) Illustrator EPS file, to us. The illustration on the right shows the doctor blade supplied with every box of 24 Capatch.